Run by Chef Oren Yerushalmi, MODERN Restaurant, at the Israel Museum in Jerusalem, offers cuisine from a contemporary and creative Jerusalem kitchen that makes a clear personal statement. 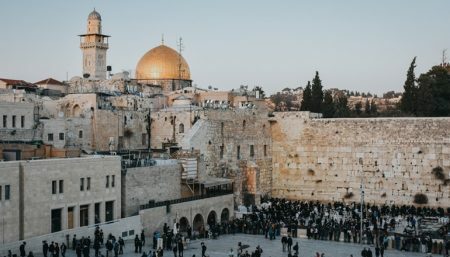 The restaurant’s design, its location inside the Israel Museum, and its view of the Valley of the Cross and the Knesset, all create a special Jerusalem atmosphere. MODERN’s dishes are based on one-hundred-year-old Jerusalem recipes that evolved outside the Old City walls. They have the warm flavors of longing for distant lands. The chef picked apart traditional recipes and reassembled them, creating a modern and seasonal menu with a local flavor and fresh ingredients. Get introduced to a new type of local food. They even have Jerusalem tapas. MODERN’s unique advantages: picturesque views, inspiring location, large and free parking by Israel Museum, modern Jerusalemite kitchen, varied menus, and professional experience in event hosting. Enjoy a variety of menus at MODERN Restaurant. Business lunch menu: Sunday-Thursday, 11:30 am – 5:00 pm. MODERN’s business lunch menu includes a starter and a main course for the price of a main course – starting from 60 NIS. In addition, the restaurant offers vegetarian, vegan, children’s, and express menus. Culinary Tuesday Evenings: Every Tuesday evening, the restaurant organizes a culinary experience with a unique and refreshing dinner menu. Perfect for tasting and sharing. Children’s menu: MODERN offers business lunches for children! The meals include chicken nuggets with French fries or a hamburger and an ice-cream dessert with marshmallow. MODERN encourages its patrons to let the kids try some of the adult dishes as well! Wine Menu: MODERN takes pride in its Israeli and kosher wine collection – the largest in the world! Find a rich assortment of bottles from unique wineries from all around the country. The wines vary in price and flavors so that every customer can find their favorite glass of wine. Not into wine? The place serves draft beers, champagne, and all other sorts of great beverages. Cheers! Menu updates: MODERN Restaurant menus are seasonal and based on fresh market ingredients. The menus are frequently tweaked and refreshed and include daily specials so make sure to ask about it! You are welcome to plan your private event at MODERN restaurant. The restaurant hosts all kinds of events: bar/bat mitzvahs, birthdays, business events, product launches, and social gatherings. Private events: Summer events – up to 350 guests. Winter events – up to 250 guests. Business events: Summer events – up to 350 guests. Winter events – up to 250 guests. Catering at the Israel Museum: up to 3000 guests. Private Terrace: up to 150 guests. The restaurant can accommodate up to 350 guests in a cocktail party settings. Events at the Israel Museum campus can accommodate up to 1500 guests. Just ask for the express menu and enjoy a wide selection of dishes starting from 60 NIS! We shared a tapas plate that was really delicious. It had hummus and eggplant and beets and tabouli and grape leaves. The room is nice and quiet and the service was good. At the Israel Museum. Very good food. Soup of the day was excellent. Salad with walnuts was delicious. Had the chicken and was tasty too!